After the head-to-head battles, they all remembered their friendships. 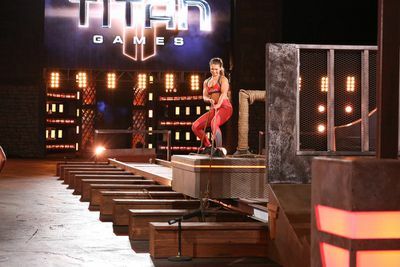 The Titan Games returned with some emotionally charged challenges. We were also reminded that there’s only one more “qualifying” episode left after this. Soon, we’ll see all the previous Titans return to whittle down their tanks. Let’s find out who moved on tonight. The strongest competitors go head to head in the arena. Ashley Hawkins: As a police officer, Ashley knows a little something about staying calm and focused under pressure. She quickly mastered the strategy of the Hammering Ram and didn’t let the fall on Rolling Ascent fluster her in the final challenge. DJ Townsel: His football and yoga skills have blended perfectly. On Vortex he opted for the longer path, but one that didn’t take as much energy. On Mount Olympus, he gazelle-trotted over the logs and smashed open the Titan tomb. Jon Brascetta and Matt Cable opened the episode with a moving match. Learning about Matt’s leukemia and long recovery was harrowing, and then inspiring. He’s a person to cheer for. Matt had a lead on Herculean Pull but lost it when he stumbled on his way to the golden poll. The competitors entered into a fierce tug of war. Matt dug deep into his reserves and out-powered Jon. 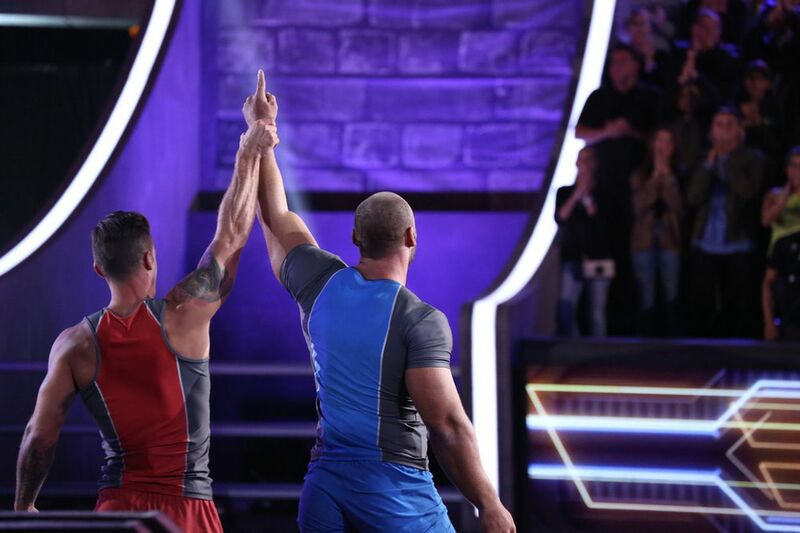 The win went to Matt and Jon gave him all the props and congratulations he deserved, stating that the two are close friends. Lauren Regno and Alma Dwumfour were only the second pair of athletes to try this challenge. Alma went in full force, knocking herself backwards at the start. Lauren tried a different strategy of laying down with her feet on the rails to pull her cart down the track. On the way back, different strategies were used again as both tried out both big and small throws. After Alma landed a big toss, she swapped back to small ones, pulling herself into a progressive lead. After she claimed the win, she ran down the track to cheer Lauren to the end in a display of sportsmanship. An explanation of these challenges can be found at the bottom of this article. Jon Brascetta: A 29-year-old martial arts and fitness studio owner. He started training at just four-years-old and is now a husband and father. Matt Cable: A 27-year-old Air National Guard Staff Sargent. Four years ago, he was diagnosed with leukemia. When his organs failed, he went into a coma and spent 18 days in the ICU and then had seven months of chemotherapy. He now benches 425 lbs and squats 600 lbs. Ashley Hawkins: A 31-year-old police officer in North Carolina. Training is part of her survival. Jenessa Goeman: A 34-year-old x-ray technician. After a bad breakup she turned to fitness to heal. DJ Townsel: A 30-year-old former NFL wide receiver who’s now a yoga master and single dad to his nine-year-old daughter. Angel Villegas: A 28-year-old barbershop owner who enters haircutting competitions. He was broke when he opened his first shop and he now owns three. Lauren Regno: A 25-year-old nursing student and mom to almost 6 year old daughter. Alma Dwumfour: A 27-year-old ICU nurse. Her job has taught her the value of every single day. Both competitors stumbled on the Rolling Ascent, with Ashley escaping first. From there, her lead increased. Ashley was heading back down to the stadium floor as Alma worked on The Cliffs. Alma never gave up, but Ashley had the clear win. The two athletes got off to a close start and flashed up the mountain. The separation came when Matt struggled on The Cliffs, giving DJ an edge. When DJ got to the ball and chain first, Matt made a great effort to close the gap, but DJ opened his tomb in a few swings and took off towards Dwayne.